The art of optimizing a website so search results for the site appear in search engines regardless of language or region. Allows content to be found and consumed by more people than the nearest competitor by increasing findability in search engines result pages regardless of the language of search. 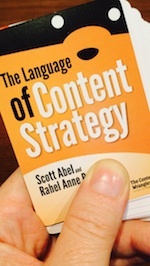 Why does a content strategist need to know this? The practice of actively maintaining monolingual and multilingual dictionaries and glossaries. Terms are organized and controlled, with a clear set of guidelines dictating their use. Enables correct and consistent use of terms throughout the translation process or any other effort requiring accurate vocabulary usage. Reduces translation time and cost by reusing translated content from the repository. Accelerates the process, and reduces the cost, of translating content and increases the availability of translated content. Linguistic quality and accuracy levels vary depending on how well the software is tuned and whether the content is post-edited by humans. Helps organizations save significant time and resources by creating content that is global by design before moving on to localization and translation. The analysis of, and planning for, the development, delivery, and consumption of global content; in essence, it is the analysis which forms a global content strategy. Reveals the benefits, risks, needs, and demands of content among all target consumers and influences better decision-making for global information exchange. Increases the relevance of the content for a particular target audience. Makes content accessible to people who speak a different language. The mental model, or classification system, of a taxonomy of content or concepts in the minds of content consumers. Includes vocabulary, organization, relationships, and interactions. To understand content consumers, you must know how they mentally structure the topics your content covers. Makes it clear who has authority to make which decisions about content and contributes to smooth operational decisions and processes. Each week, we feature a guest expert who will define and help you understand an important term every content strategist should know and understand. 52 weeks. 52 terms. 52 definitions. 52 essays from 52 experts. This is the beginning of a common language. 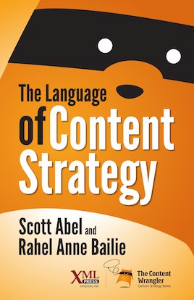 The language of content strategy. No license for Scroll Viewport installed. — Get a free trial or buy now.